Don't always do the expected. Mix up the way you structure your next advertising campaign and add some unusual and fun elements. We have a fabulous range of stress toys in the shapes of fruits that will delight your clients and get people talking about your brand. This cute banana is ideal for fruit and vegetable stores, fresh produce markets, farming enterprises, restaurants or any business who wants to promote health. 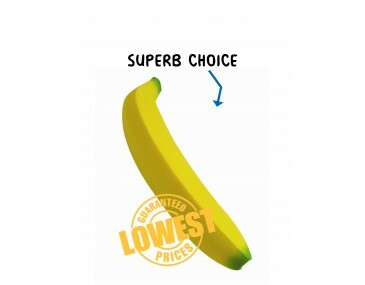 Brand your company logo and graphics onto the bananas and hand them out to clients. Not only are they fabulous little miniatures, but they are great for relieving stress and tension that affects so many people in their day-to-day lives. As an alternate option, please check out our health themed stress balls for marketing campaigns around a health. When you cannot get to the gym, or out for a run, grab your stress toy, bash it a few times and you will soon be feeling calm and relaxed. Our bananas are made from a pliable material that can be squeezed, bashed and smashed and will keep its shape. It features a classic design of a long unpeeled banana with a curved stem at the top. Make use of this fun promotional toy to add some pizazz to your advertising campaign, our listed price includes branding of your logo or graphic in a single colour print. We offer a product turnaround time of two weeks, but we can offer even faster turnaround times for urgent orders. This product can be supplied unbranded if required. This item is available for delivery within Australia only.